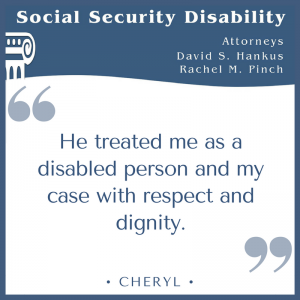 Thanks to David Hankus, he didn't give up on my fight for my Disability Benefits. I couldn't have been in better hands than his. 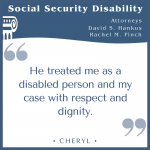 He treated me as a disabled person and my case with respect and dignity. I know without his knowledge and support I could not have succeeded. I will always remember and appreciate his tireless, hard work for me despite my not being able to pay him what he earned and deserved. I didn't know a lawyer in my life until Mr. Hankus, I was frightened every step of the way. He carried me mentally and physically so to speak on his back through every step while fighting for me with the court system. I will highly recommend him for the rest of my life. Thank you.